PRINCES Street was brought to a standstill as police tried to talk a man down from the top of the Scott Monument. But officers faced a very modern problem as scores of onlookers stopped in their tracks to film and take pictures of the rescue mission. Police on the ground tried to persuade some of them to put their smartphones and cameras away – while those who continued to capture images faced a significant backlash on social media. Dozens of people who gathered at police cordons on Princes Street took to Twitter and Facebook during the incident to criticise others for taking pictures. It is understood the man was at the top of the 200ft-high monument for just over an hour yesterday before rescuers brought him down to safety. 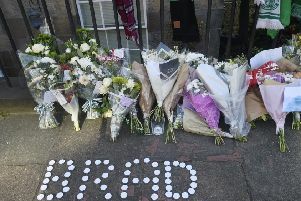 No-one was hurt in the incident, which saw trams and buses kept away from the area, while Princes Street Gardens was also cordoned off due to the incident. A Transport for Edinburgh spokesman confirmed that trams continued to run from the West End to the airport, but were stopped from entering Princes Street. Eleanor Bryce, 71, from Barnton, had been enjoying her afternoon stroll with her friend Irene before bumping into the commotion, which began at around 2pm yesterday. She said: “We had no idea what was going on, all we could see was hundreds of people looking at the monument and taking pictures when we came out on to the street after having our lunch. “There’s loads of people going about with their cameras. Another onlooker, who asked not to be named, said: “I’m only standing here because I can’t get through to get my bus home. “I don’t think it’s right people are taking pictures. As the police brought the man to safety at around 3pm, the crowd erupted into an applause and the street was restored to normality shortly afterwards. A spokesman for Police Scotland confirmed that officers had been in attendance and that the incident was resolved without anyone being hurt. A spokesman said: “Police were in attendance on Princes Street following reports of concern for the safety of a man on the Scott Monument.